Hong Kee Mah Chee operates at an almost hidden stall tucked under some shady trees and parked in front of a house, pardon me, their house on Jalan Queen in Pasir Pinji. This friendly lady attended to my endless barrage of queries (typical lah …. curiosity can kill a feline, but cannot dent the spirits of MM), all the while swiftly pinching away at the starchy dough that sat in the mysterious hollow contraption resembling a flower pot. For more than 30 years, she has been the talk of the town, so to speak. When it comes to Mah Chee or Mua Chee in Ipoh, instantly the name Hong Kee (actually it’s “Fong Kee” in Cantonese, thanks to Jason who can read Chinese better than me) springs to mind. She took over this stall from her father (the Sith Lord himself; picture at the end of this post … sit still, people!) whom in turn started this Mua Chee and Fa Sang Woo (Sweet Peanut Broth) business way back over half a century ago. 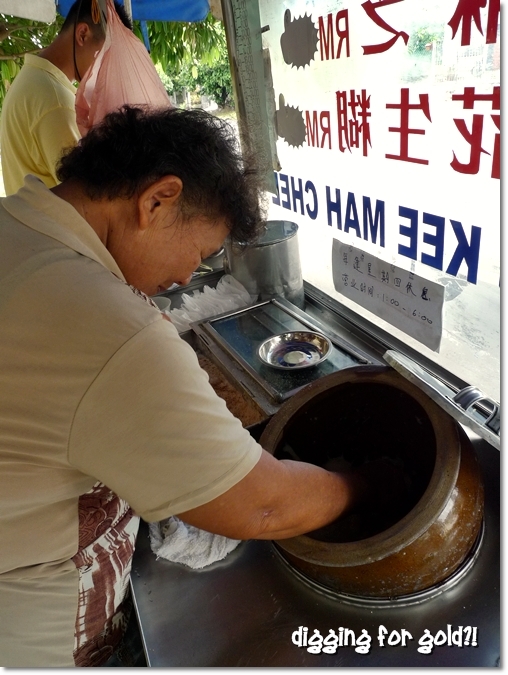 But he was peddling his stall around back then, not merely operating from a stagnant, fixed position according to this lady …..
A serving of Mah Chee at RM2.00/USD0.60 that comes in cute,rounded shapes, pinched with almost the same consistency and uniformity. Hong Kee Mah Chee was even featured in the media before, most notably in the TV program “Ho Chak” on 8TV. I remembered how they were sheepishly inept in replicating her swift, almost robotic yet faultless motion when pinching the dough into uniformed sizes, then proceeded to mix the starchy dough (made from glutinous rice flour/tapioca flour) thoroughly with the mixture of finely-grounded peanuts and sugar contained in a separate steel contraption. See how she and her son miraculously work up a storm, pinching, mixing and dishing the Mah Chee out in a matter of seconds. No doubt some may complain that the Mah Chee here is a little pricier than the usual stalls, which sell theirs at about RM1.50 each. But I shall not compare, given the fact that probably you’re paying for some eye candy (don’t get the wrong idea!) in the form of boundless energy channeled into the making of your plate of Mah Chee, as opposed to the generic method of cutting up the sticky dough with a metal cutter instead. 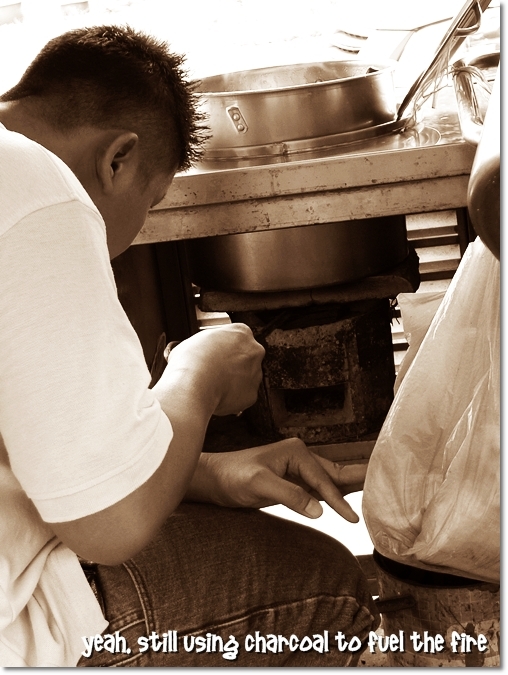 Noted that they are STILL using charcoal to fuel the fire that keeps the “Fah Sang Woo” warm! Don’t breeze past the road without looking to your LEFT (if you’re coming from town’s direction). Just look for the blue-white canopies, and you’re good to go. Thanks to Jason, I realized my dream. Hahaha …. and to imagine this stall was rather easy to locate, even without prior knowledge of its location. Directly by the roadside, without any obstacles or other hawkers/peddlers thriving about. So if you’re ever around Pasir Puteh, or Pasir Pinji running your errands or having a hell-of-a-big-feast for lunch, consider dropping by Hong Kee for a packet or two of their famous Mah Chee and/or a warm serving of Fah Sang Woo. Ginger-licious lamented about the lack of crowd as of late, compared to its glittering years. WMW went for this after our short (hehe) meet-up at the BIG TREE FOOT. Extra ingredients?!! 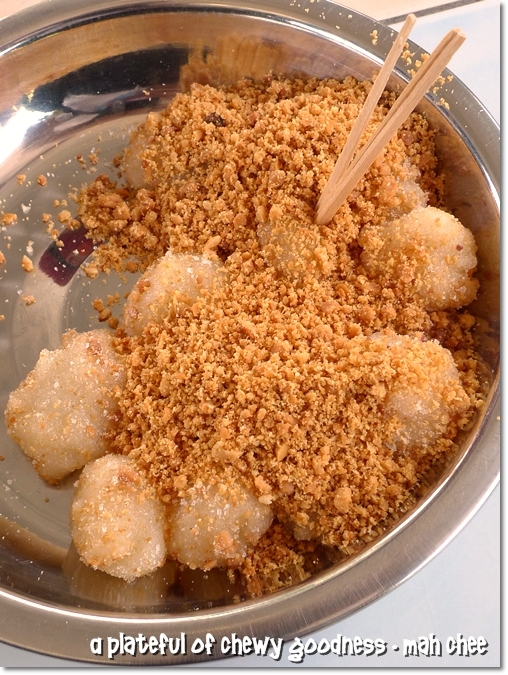 Haha .. nolah, she took out the mua chee from the container only, before mixing with the peanut and sugar. i remember liking it a lot as a kid, but i haven’t had it in possibly a decade! A DECADE?!! Wah … that’s long. Penang’s Gurney Drive has a rather good stall, with optional fried shallots scattered on top. Yeahloh …. should be a MUST stop over as well, if only it’s nearer to town centre. Hi zack, you’re probably the same age like my parents then. They told me about this man going around town, selling mua chee. 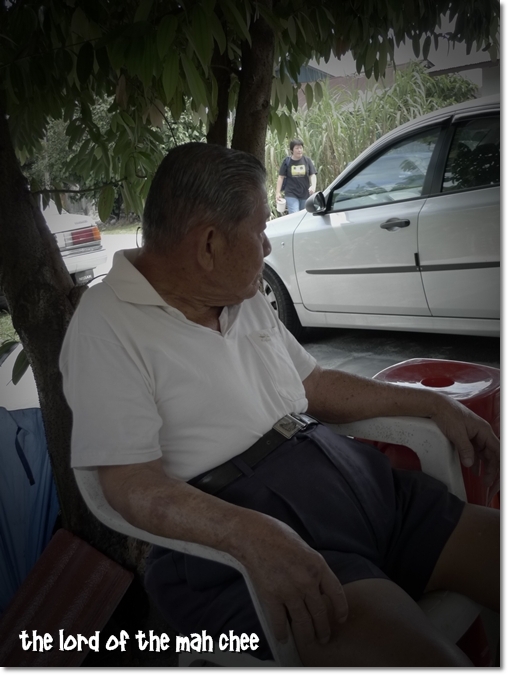 I am not that old, the most I older than you few years…Nice to read your blog, its become my food guide whenever I am in Ipoh..feel a bit malu, cause I am also Ipoh lang also. Keep it up and good effort. Hey zack, nothing to be ashamed of. I did not know much about the food outlets in Ipoh, and their history either. Until I started this blog for fun two years ago. Guess as they said …. I never looked back since! Petaling Street I not so sure, though I don’t doubt the snacks from the streets. This stall’s mah chee is my favourite, and I can recognize the lord of mah chee, always helping at the stall. Haha … friend friend with him ah? Maybe I show him your photograph, then can get discount or something. The last time I brought my Penang friend over, they feel gross when see the way they prepare the mua chee. Once put in a bite, they ask for seconds. lol …. I ordered double for myself in advance. No need to wait. Yeah that’s my FAVE, too.. never fail to tapau when passing by this route..
the mah chee is good. never fail to stop by if i’m in that area. 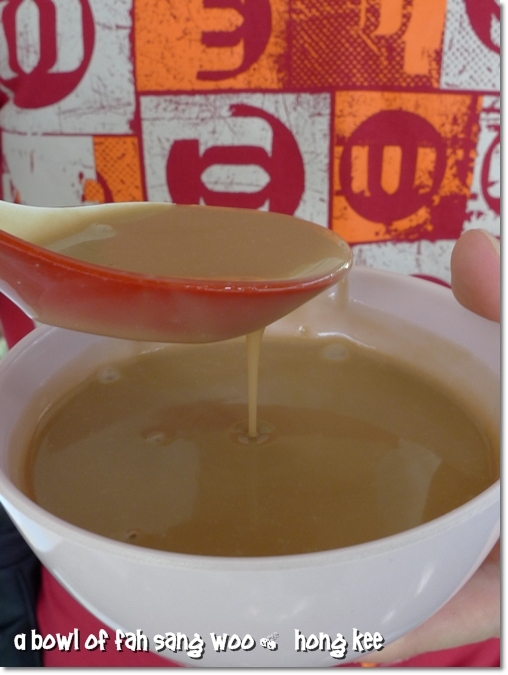 the peanut soup is very creamy in texture but i prefer mine sweet. this is more on the saltish side. I love mua chee last time, but due to its higher carbohydrate content, I have more or less stopped taking it. I didn’t know there’s such a treasure in Pasir Pinji, hehe! Will definitely check it out next trip. best peanut soup i ever had 🙂 my all time favorite. Hmm … not advertising lah. But indeed, it should be a stall worth visiting. Instead of tourists coming over to Ipoh and only go for the same old nga choy gai and white coffee only. I visited this stall after reading about it in the Metro Perak. Hmmmm…J2Kfm, you should revisit this stall…..my opinion: the standard is not great, I can get better tasting muah chee in PJ or Ipoh, it is mucho expensivo!! 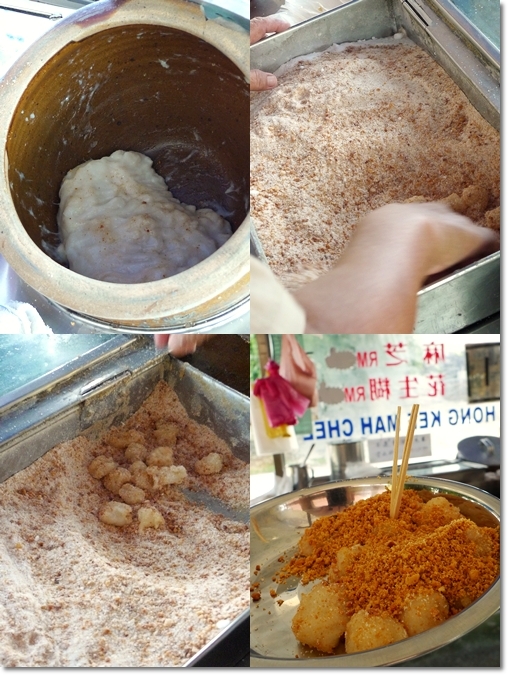 And the fah sang woo – well I think even Mun Choong serves a better version of it. That’s my opinion, no offense to others who love this stall. Enjoy! Okay KL Girl … will do. Jatuh standard or memang not that great to begin with? The mua chee was good, due to the fact that the aunty pinched and squeezed every single morsel (hehe), though slightly overpriced IMO. The Fa Sang Woo was good the last time, though it’s been 3 years since my last visit I believe. to reword this…. Thank YOU for the meal!! But yeah, thanx for spending time to talk about this topic here on your internet site.